Wed., Nov. 29, 2017, 10:20 p.m.
ANN ARBOR, Mich. – Arike Ogunbowale scored 20 of her 32 points in the first half, and No. 3 Notre Dame remained undefeated with an 83-63 victory over No. 22 Michigan on Wednesday night. The Irish (7-0) earned another impressive win heading into their showdown with No. 1 UConn this weekend. Notre Dame held Michigan star Katelynn Flaherty to 13 points on 5-of-18 shooting. It was the first time all season she scored fewer than 20. 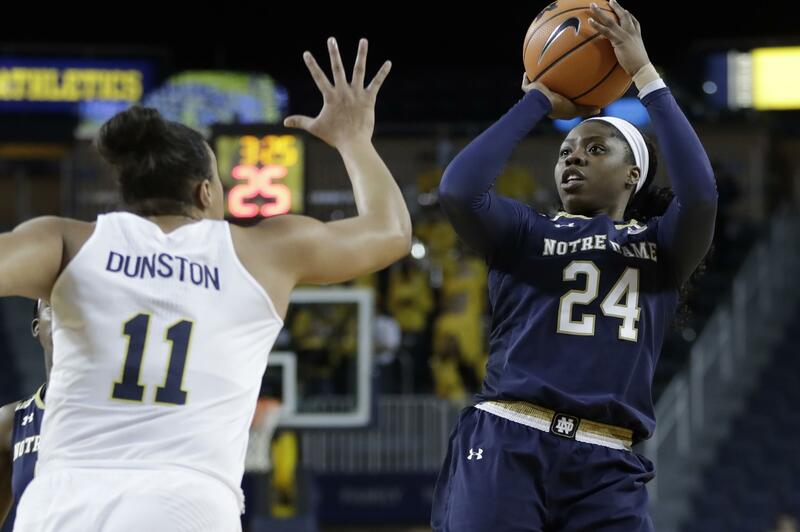 Jackie Young added 18 points and 14 rebounds for Notre Dame, which was coming off a win over defending national champion South Carolina last weekend. The Irish have played their last six games away from home. Hallie Thome scored 24 points for Michigan (4-2). JACKSON, Miss. – Teaira McCowan scored a career-high 31 points and grabbed 20 rebounds to lead Mississippi State over Louisiana-Lafayette. The 6-foot-7 McCowan couldn’t be stopped, making 15 of 20 shots from the field and had four blocked shots and three steals. Victoria Vivians added 16 points for Mississippi State (7-0). Louisiana-Lafayette (2-5) was led by Skyler Goodwin, who scored 14 points. IOWA CITY, Iowa – Shakayla Thomas scored 17 of her 31 points in the fourth quarter and Imani Wright added 26 points as No. 13 Florida State erased a 12-point deficit in the final period to beat Iowa in the Big Ten/ACC Challenge. Megan Gustafson, who scored 34 points on 15-of-18 shooting, scored the first six points of an 8-0 run to end the third quarter and the first four points of the fourth quarter to put Iowa (7-1) ahead 75-63. Thomas, who also had 10 rebounds, ended the run and then had the first basket and the last 11 points in a 15-2 run that put the Seminoles up 80-79 with 3:13 to play. The teams traded the lead with big 3s and free throws, with Gustafson tying the game at 85 with a pair of free throws with 48 seconds to go. Wright answered with a 3 and after a steal by Thomas, A.J. Alix made two free throws with 24.7 for a 91-86 lead. Tania Davis knocked down a 3-pointer for the Hawkeyes with 17.2 seconds to go. Both teams then went 1 of 2 from the line before Thomas made it a two-possession game with two foul shots with five seconds left. Davis ended it with a 3 at the buzzer. FSU (7-0) is 9-2 in the challenge with its current six-game winning streak, the longest of any school. CHARLOTTESVILLE, Va. – Kaila Charles scored Maryland’s final three points in the last 40 seconds to lift the Terrapins to a victory over Virginia. Charles drove the key, crossing over for a layup on the left side, for a 59-58 lead and made 1 of 2 free throws with 18 seconds left after being fouled on the defensive glass. She finished with 13 points. Virginia’s Lauren Moses made 1 of 2 free throws with 14 seconds left and Maryland turned it over, but Dominique Toussaint missed a 3-pointer and Jocelyn Willoughby the put-back in traffic as time ran out. Stephanie Jones also scored 13 points for Maryland (6-2), which won its fourth straight. Kristen Confroy added 12 and Ieshia Small 10. Toussaint scored 18 points, J’Kyra Brown 11 and Felicia Aiyeotan 10 with six blocks for the Cavaliers (3-5). SAN FRANCISCO – DiJonai Carrington and Alanna Smith scored 19 points apiece, Kiana Williams added a career-high 17 and Stanford made a school-record 11 3-pointers in the second half to pull away for a win over San Francisco. The Cardinal (5-3) trailed 28-24 at the half as both teams shot less than 30 percent. For much of the second half, both teams shot better than 60 percent, with Stanford finishing at 59 (23 of 39) and the Dons dropping to 50 percent. Stanford quickly passed USF in the in the second half but back-to-back 3-pointers by Ninni Salmi put the Dons up 40-38. A 10-2 run put the Cardinal up for good and they led 56-49 after three quarters. Brittany McPhee, Stanford’s leading scorer at 16.5, missed her fourth-straight game with a right-foot injury. Salmi and Michaela Rakova had 15 points each for San Francisco (2-4). COLLEGE STATION, Texas – Anriel Howard had a career-high 23 points and 13 rebounds, Danni Williams added 19 points, and Texas A&M beat Rice. The Aggies led by 10 with 24.2 seconds to play. Chennedy Carter made 7 of 8 free throws and scored 17 points for Texas A&M (6-1), which was 14 of 21 from the line compared to Rice’s nine attempts. Howard scored eight of Texas A&M’s opening 10 points and the Aggies closed the first half on a 10-1 run for a 36-33 lead. Howard had 12 points and five rebounds in the half and Williams added eight points. Erica Ogwumike led Rice (5-2) with 26 points on 11-of-13 shooting for her third straight game with 20-plus. She made three of Rice’s program-record 15 3-pointers, topping its previous best of 12. Nicole Iademarco added four 3s and 18 points, Olivia Ogwumike had four 3s and 14 points, and Wendy Knight finished with 10 points with eight assists. PRINCETON, N.J. – Alex Louin scored 16 points, Adrianna Hahn added 15 points, and Villanova held off Princeton. Louin made two free throws with 4:03 left to extend Villanova’s lead to 62-53 but the Wildcats went scoreless the rest of the way. Princeton’s Bella Alarie made four straight free throws on back-to-back Tiger possessions and Abby Meyers’ basket with 40 second remaining made it 62-59. Megan Quinn missed a shot for Villanova (6-0) and Gabrielle Rush’s 3-pointer in the closing seconds was off the mark. Alarie had a career-best 29 points, nine rebound and three blocks for Princeton (3-2). Published: Nov. 29, 2017, 10:20 p.m.